Remember the subprime mortgage crisis? According to the FDIC, community banks might be setting themselves up for a repeat. Community banks provide funding for community development and home building on Main Street USA. The broad category of real estate lending, known as commercial real estate loans, are divided into two categories: construction and development loans and nonfarm/nonresidential real estate loans. Back in the fall of 2005, the Federal Reserve, U.S. Treasury and the FDIC realized that community banks were lending funds to the housing and real estate markets at a pace above what these regulators thought as prudent. Now it appears to level of lending has risen to dangerous levels yet again despite new guidelines formalized by the end of 2006. Anyone invested in community banks should think twice about how much they hold and consider selling. How could this happen when there are rules in place? Regulators ignored their own guidelines. The first guideline says if loans for construction, land development, and other land are 100% or more of total risk capital, the institution is considered to have loan concentrations above prudent risk levels, and should have heightened risk management practices. However, even as the subprime mortgage problems began to surface, these regulators shrugged them off saying subprime issues would be contained and not spread to the rest of the economy. They were wrong. And now the FDIC is concerned. 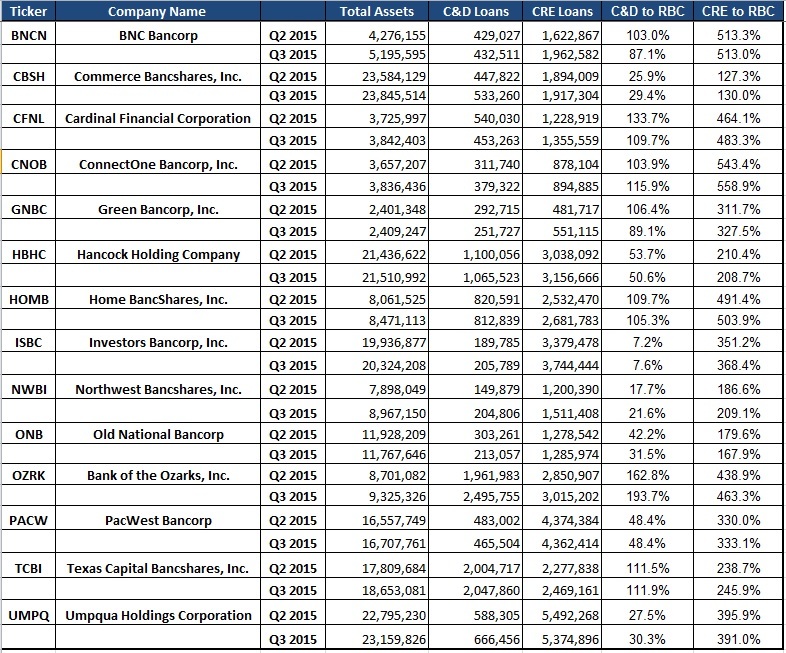 Here is a table of 14 publicly traded community banks and their exposures to C&D loans and CRE loans. The table above shows data for the second quarter and third quarter for each bank; Total Assets, C&D Loans Outstanding, CRE Loans Outstanding and the risk ratios versus risk-based capital. C&D to RBC and CRE to RBC. Here is an outline for each community banks in the table above. BNC Bancorp (BNCN - Increased total assets in Q3 but remains overexposed to CRE loans. Commerce Bancshares (CBSH - Get Report) - Set a new high off $47.11 on Nov. 27. Not overexposures. Cardinal Financial Corp (CFNL - Increased total assets in Q3 and is overexposed to both C&D and CRE loans. ConnectOne Bancorp (CNOB - Get Report) - Increased total assets in Q3 and is overexposed to both C&D and CRE loans. Green Bancorp (GNBC - Still slightly overexposed to CRE loans. Hancock Holding (HBHC - Not overexposed to C&D or CRE loans. Home BancShares (HOMB - Get Report) - Still overexposed to C&D and CRE loans. Northeast Bancshares (NWBI - Get Report) - Increased total assets but are is not overexposed to C&D or CRE loans. Old National Bancorp (ONB - Get Report) - Decreased total assets slight and is not overexposed to C&D or CRE loans. Bank of the Ozarks (OZRK - Increased total assets and became more overexposed to C&D and CRE loans. Texas Capital Bancshares (TCBI - Get Report) - Increased total assets and is slightly overexposed to C&D loans. Umpqua Holdings (UMPQ - Get Report) - Increased total assets and remains overexposed to CRE loans. Here's a primer on these loan types followed by the regulatory guidelines for risk exposures to these loans. Construction and Development Loans are the most risky component of real estate lending as community banks lend in tranches. Phase one is the loan to buy the property to be developed. Second is the building of the infrastructure; clearing the land, building the roads and providing the underground utility services to the plots where homes will be constructed. Overly simplified, community banks are not paid back until homes are sold and other banks underwrite mortgages for home buyers, or until the project is funded via a Municipal bond offering. Municiplay bond underwriting is used by larger communities. These are usually sold to institutional investors, and the proceeds pay off the C&D loans funded by community banks. Homeowners who buy a home in a Community Development District, make interest and interest payments as a portion of their CDD annual assessment. Other community fees in these assessments include recreation centers, pools, road and landscaping maintance. The CDD assessment is handled as a line item on county taxes. A CDD is like a local government with board members elected by residents to manage the CCD bonds and the common affairs of the community. Community banks failed when major developments failed before buyers of the CDD bonds took on this risk. This was a major issue when the housing bubble peaked in mid-2006. There are many zombie communities around the country that were started as the housing bubble was inflating, but when homeowners began to default on mortgages, community banks overexposed to C&D loans, began to fall like dominoes beginning in 2008. 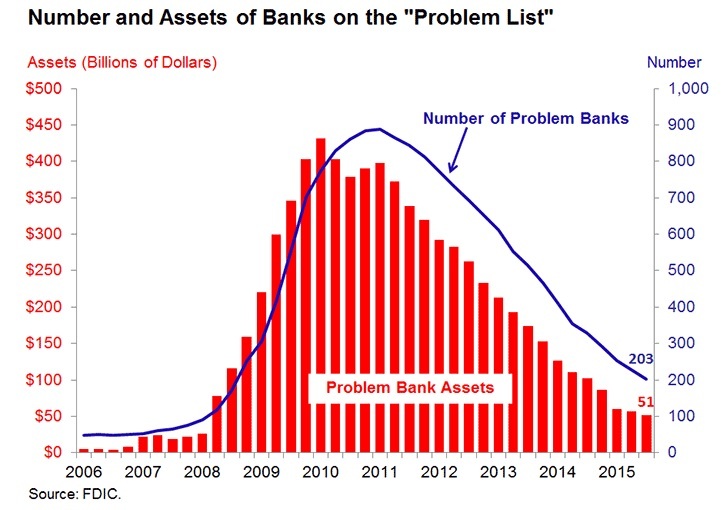 Here's a chart of banks on the FDIC "non-public" list of problem banks. Nonfarm/Nonresidential Real Estate Loans is the second component of CRE lending and is considered less risky. These loans fund the construction of office buildings, strip malls, apartment buildings and condos.